The common approach and methodology used which connects the three topics is service design. The process used to design a service concept included the phases of insights, ideation and concept. Customer insights have been collected using online survey and cultural probes. An expert interview, desk research and trends have been used to gather insights about the market. Service ideas have been generated using the ideation technique of opportunity brainstorm and customer value constellation. The service concept was then concretized with the tools mapped in the chapter about the service concept. The tools used were Service World, Service Canvas, Moodboard, Service Poster, Service Blueprint and Customer Journey. In addition to these I developed Product Criteria and Core Components that influence the supermarket experience. 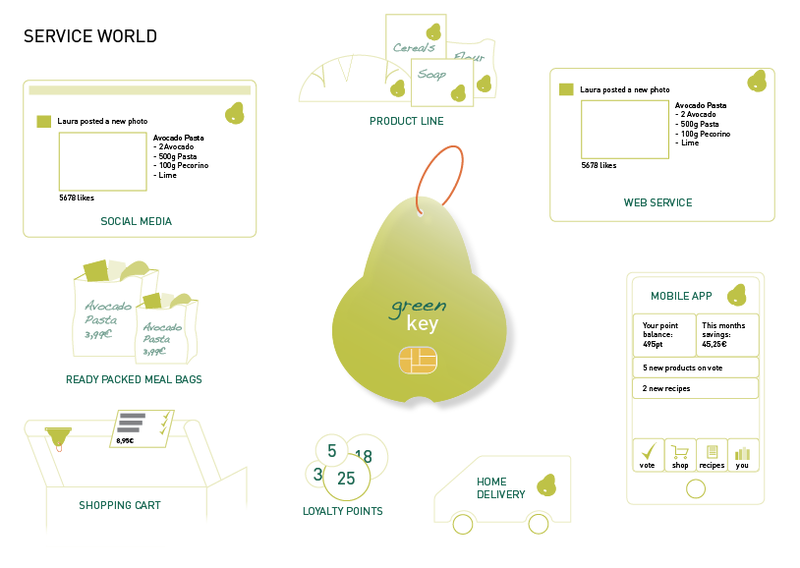 Based on the theory, the insights collected and the ideation exercises, I developed a service concept called Green key. The service contains several services and different touchpoints that evolve around a little chip, the green key. The green key chip is technology-enhanced token that allows the customer to identify herself in the supermarket by plugging the key into the shopping cart or basket. The chip can be attached to a key chain and carried along. A shopping cart with a touch display shows customer generated or supermarket provided shopping lists, store orientation, location of products, recipes and the items added to the shopping cart with nutritional information, alternative product recommendations and pricings. 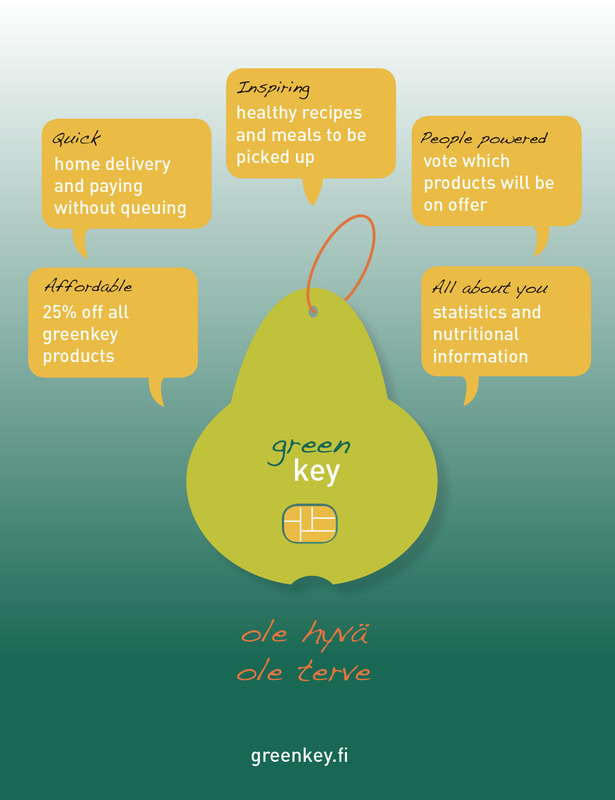 The customer can install the green key app, which gives an overview over spendings and nutritional values, shopping lists, recommended recipes and savings. With the app the customer can order groceries easily online, apply earned discounts at check out or check out through mobile payment in the shop. In the web touchpoint, the customer can suggest new products to the shop or use votes to vote on which products should be on offer. The service comes with it own product line, which is a collection of products with strict product criteria according to organic principles. The product line carries the green key label to help customer recognize the products easily. The social media channel Facebook is used for the meal of the week campaign, where customers can vote recipes posted by other customers. With this people empowered campaign customers can choose ready packed meal bags for a special price to the supermarket. Additionally the supermarket will offer a small range of ready packed meal bags with ingredients and a recipe that are easy to cook and of high nutritional value. The customer only picks up the bag, pays and can prepare the meal at home. The meal chosen through the Facebook campaign will have a special offer price and feature the customer who has submitted the recipe. The thesis has highlighted the need and relevance for developing transformative services that create value for both the customer and the business by encouraging customers to live a healthier life through the consumption of healthier and sustainable food. The service concept developed suggests a set of services that can be considered a new business opportunity for the grocery trade. The service opportunities presented have a strong link with the trends outlined in the theoretical part of the thesis and translate the concept of transformation through services into a tangible service concept. The customer insights have shown that there is a need to develop services that support busy people in the purchase and preparation of food products which is in contrast with the current activities of the Finnish grocery trade business, which is focusing on product innovation rather than service innovation. 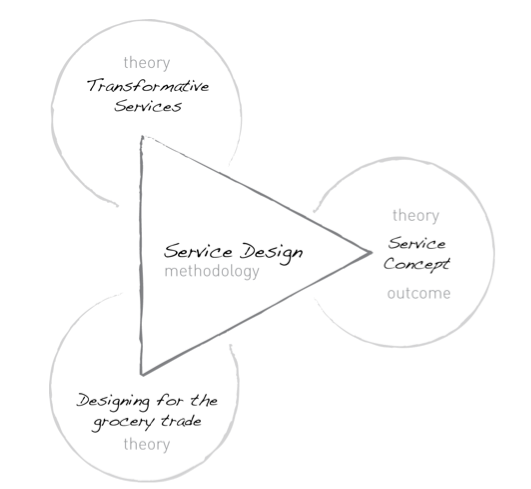 The thesis has contributed to the discussion on transformative service as well as created a new discussion of how to translate the theoretical discussion of a service concept into service design tools. Finally the use of digital technologies in the development of the service concept have highlighted the opportunities that these technologies offer to service innovation.